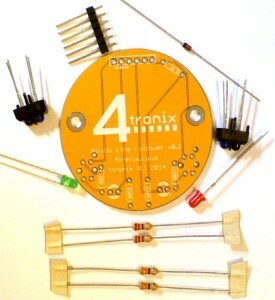 This still represents great value and you get an awful lot of bot for your money. 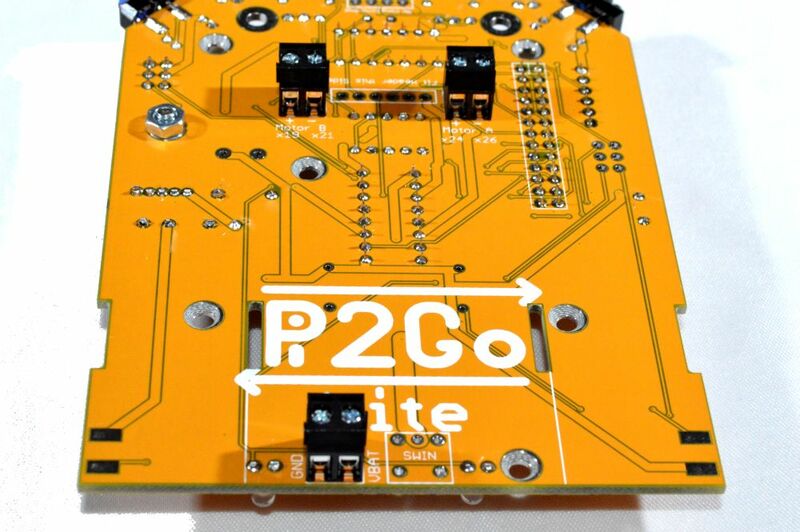 At the Cambridge Raspberry Jam on 6th September, we will have a small number of Pi2Go-Lite kits available for immediate purchase at a great one-off price. 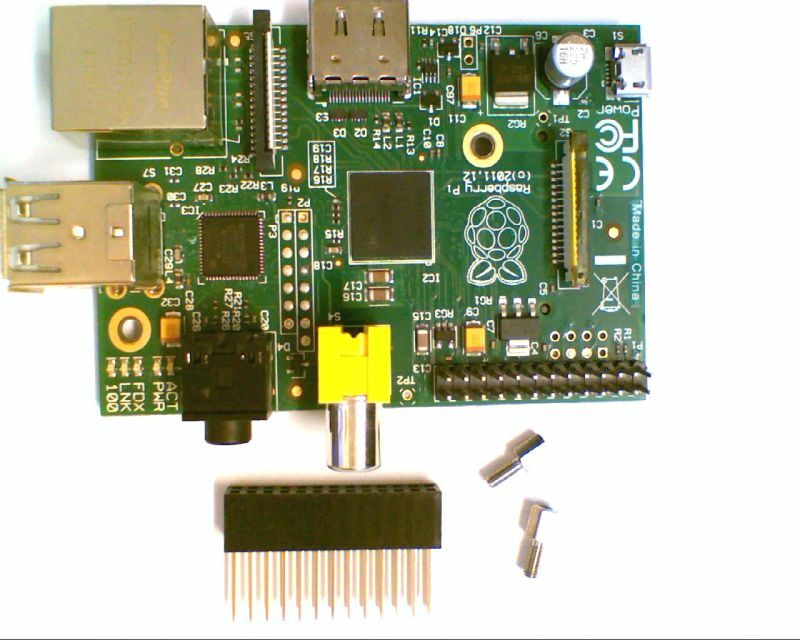 Anyone at the Raspberry Jam will be able to pick one up and take it home on the day (while stocks last). 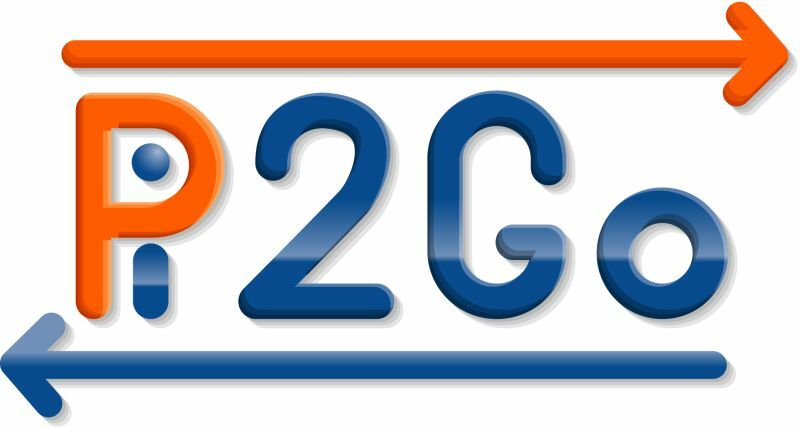 Also, the full Pi2Go (subject to some test results) will be available for pre-order with expected delivery end-September or early October. 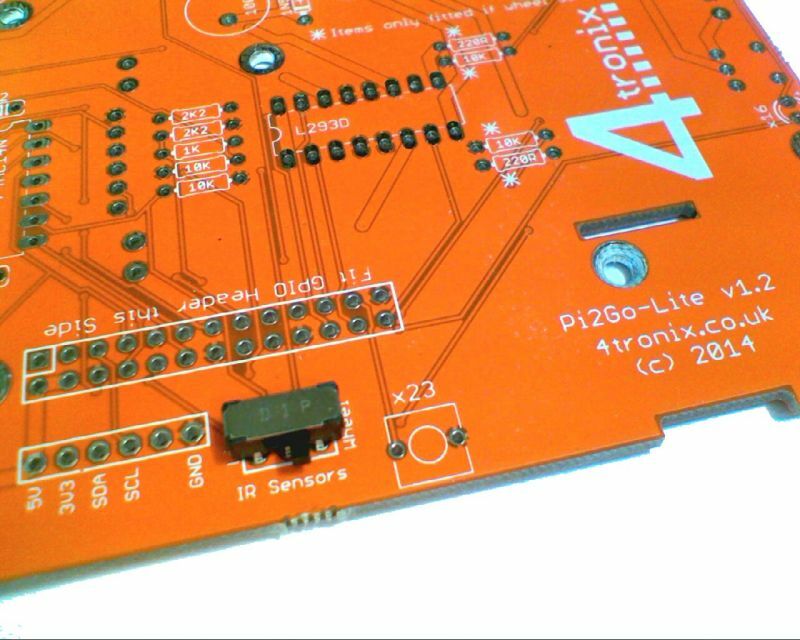 We have sent the Pi2Go for CE testing. 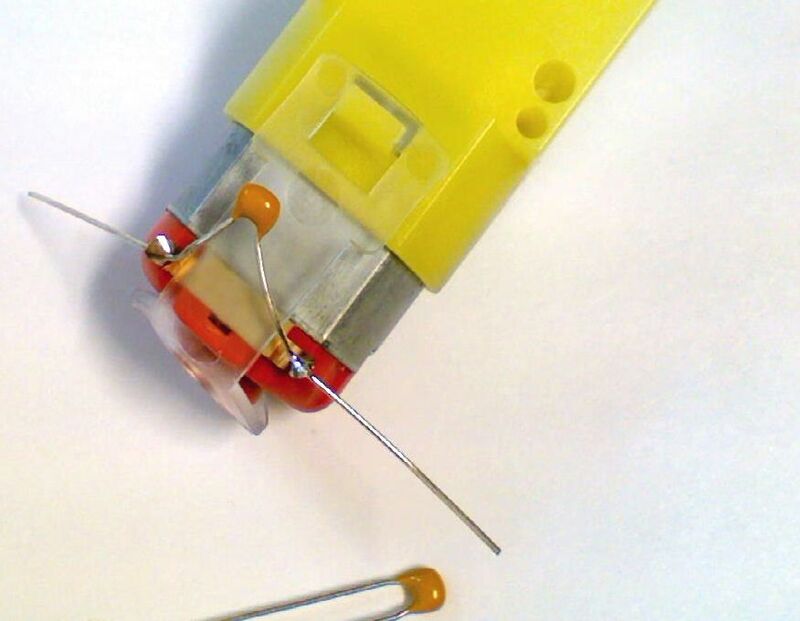 This is important and we must pass these tests before we can claim CE compliance. 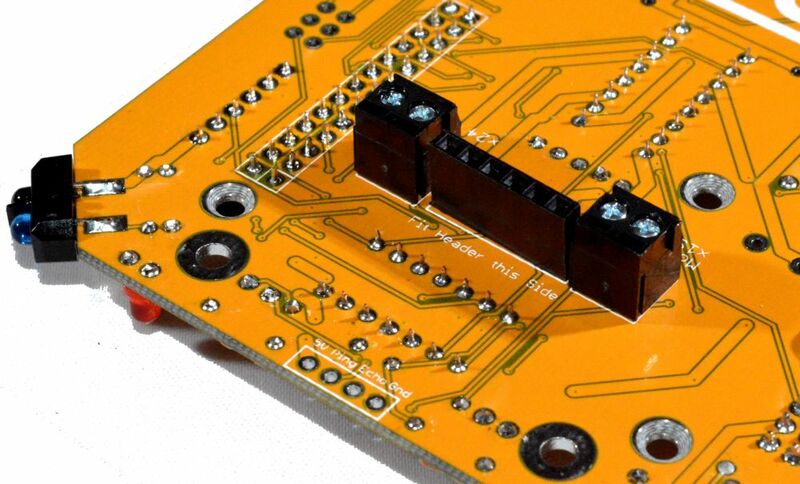 If there is a problem with the testing, then we may have a delay to shipping. I’ll let you know what happens and whether we can still start taking pre-orders, as soon as I can. 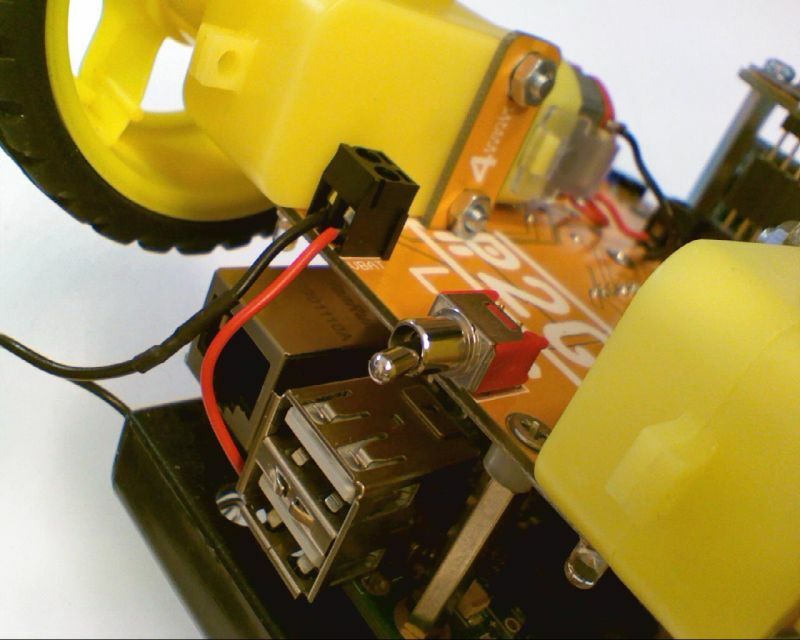 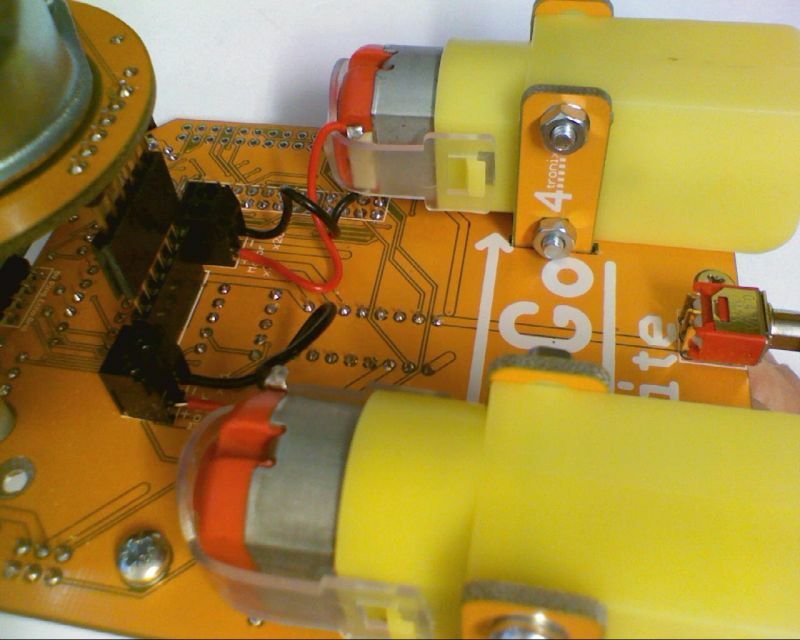 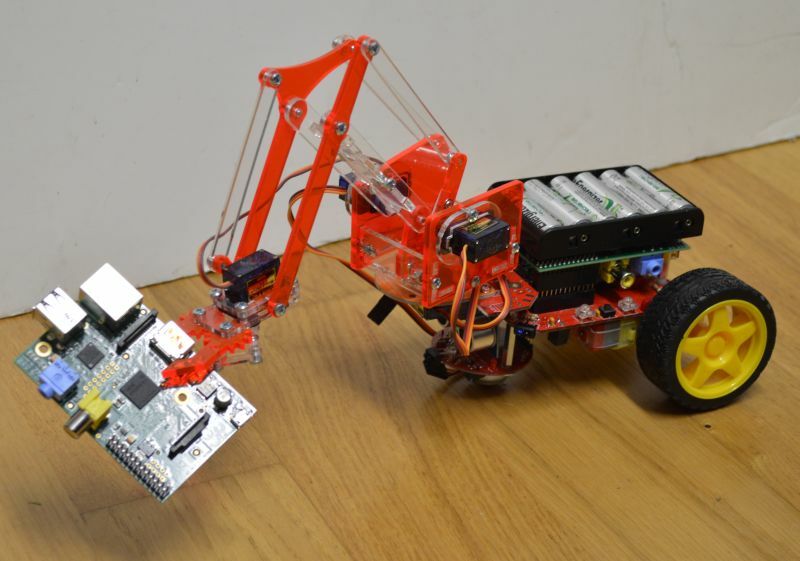 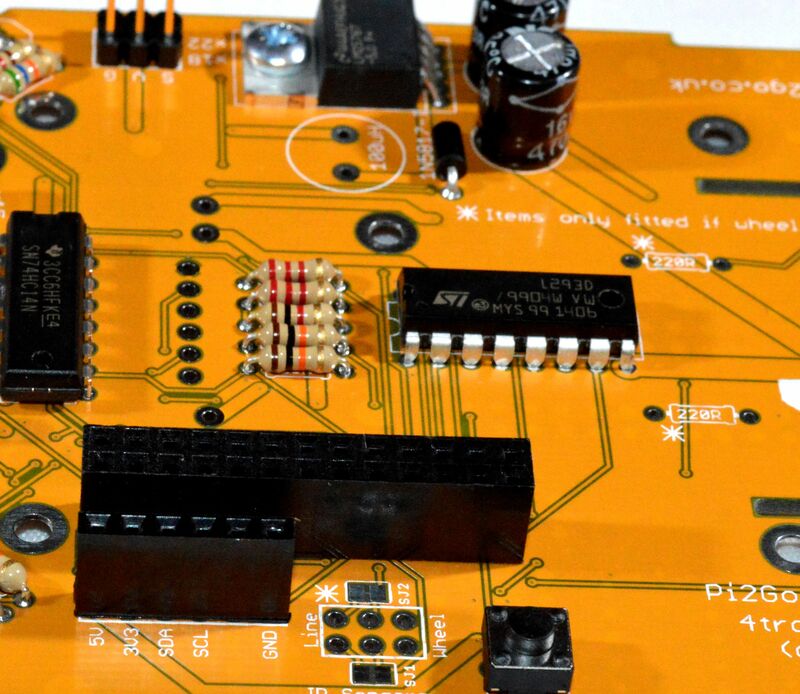 The Pi2Go kits that are being released have nearly been complete. 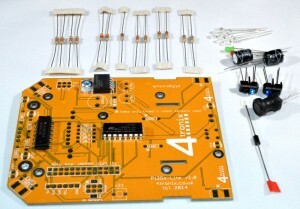 The final part was to receive the release PCBs, which arrived yesterday (Thank you DHL – delivering on a bank holiday!). They tested fine and are now being put into the kits ready for the release date in a week and a half. 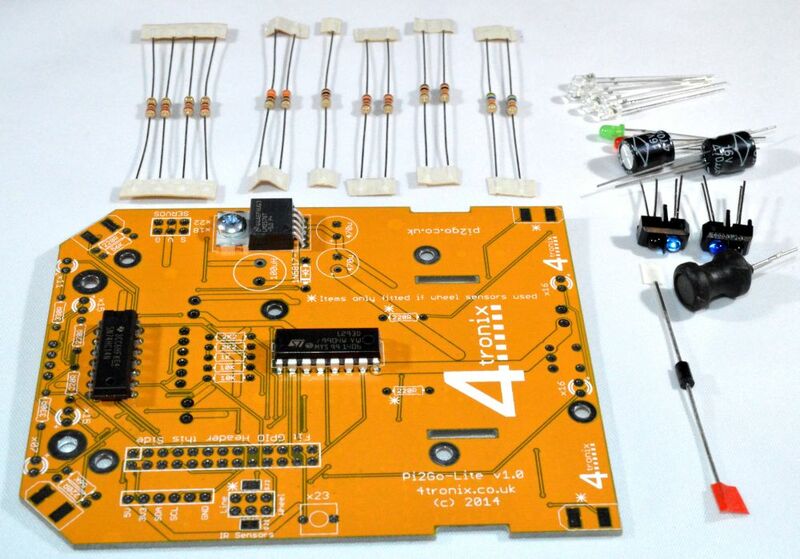 First check which version of the main PCB you have. 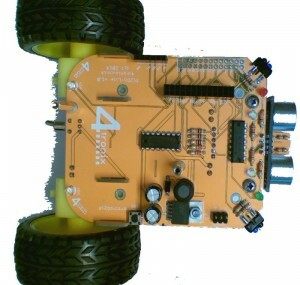 It is marked above the left motor “Pi2Go-Lite v1.x”. 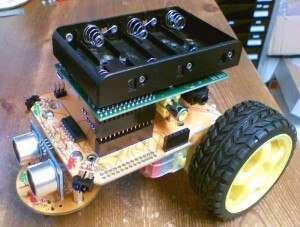 There are minor changes to some parts of the build. 11. 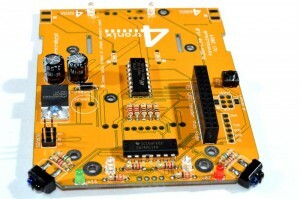 Add LEDs at front of board. 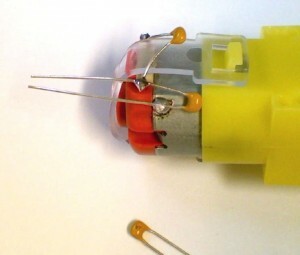 Red is for port (as in the wine), left. 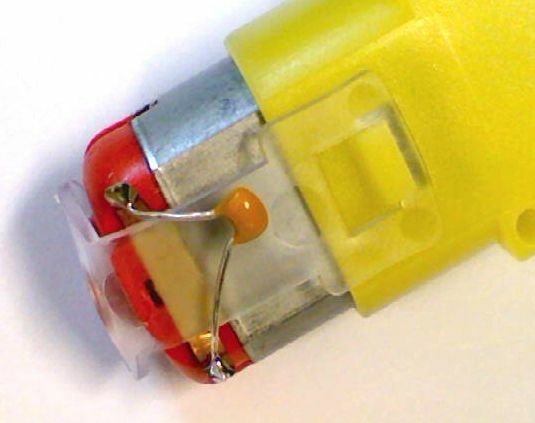 Green for starboard, right. And 2 white LEDs. The position of the jumpers (v1.0 and v1.1) should be as shown below. 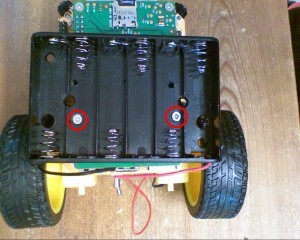 Put both jumpers to the left for line following, and to the right for wheel sensing. 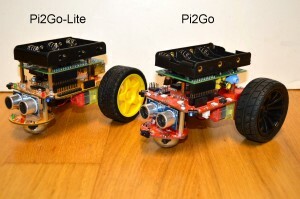 Note that the jumpers should be aligned along the length of the Pi2Go-Lite, not across the board. 19. 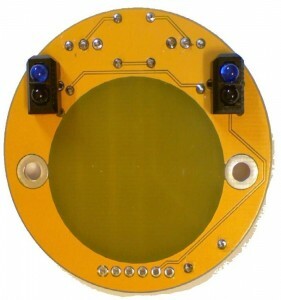 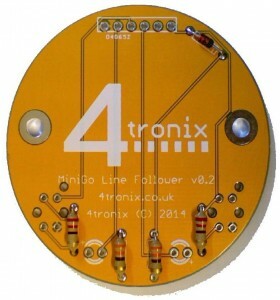 Add the 6-pin female connector to the bottom of the PCB. 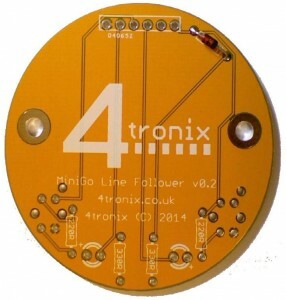 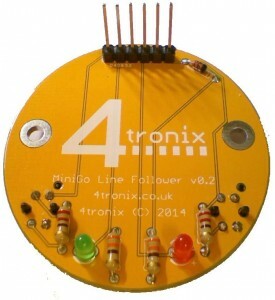 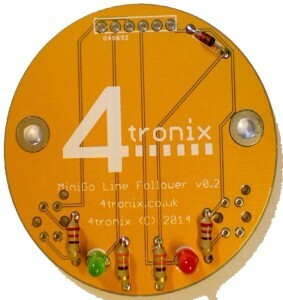 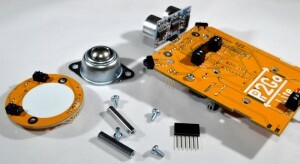 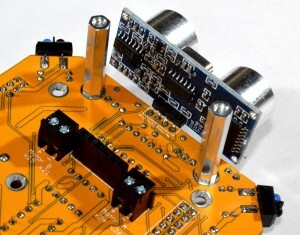 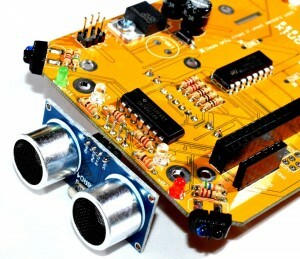 Ensure that it is mounted perfectly vertical as it is used to connect to the line follower board. 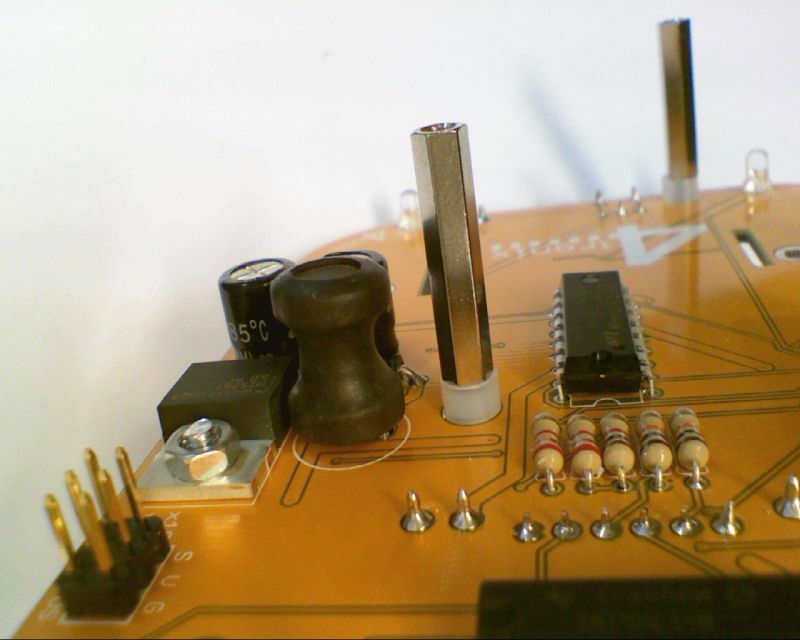 Solder one pin, then adjust the position with one hand whilst keeping the solder melted with the other. 3 hands helps here! 21. Solder the ultrasonic sensor board to the bottom of the board, facing forward. Ensure it is fully inserted and horizontal. NOTE: Sometimes we receive a batch of ultrasonic sensor modules where the header is on the same side as the sensors. 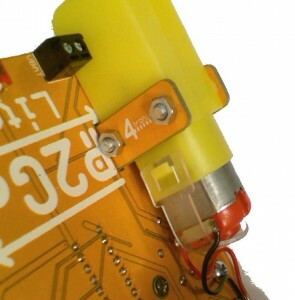 Do NOT fit these. Contact us immediately for a replacement. 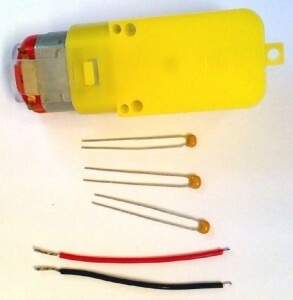 If these are fitted, they will interfere with the mounting pillars and may cause a short-circuit. The PCB is now fully soldered. 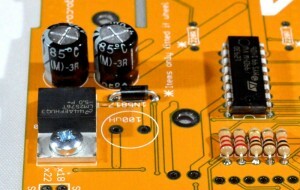 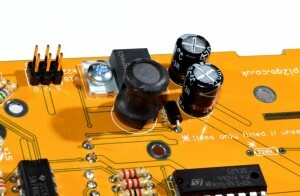 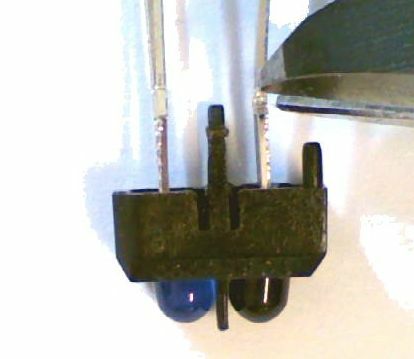 Feed a capacitor through the metal terminals and solder as shown. 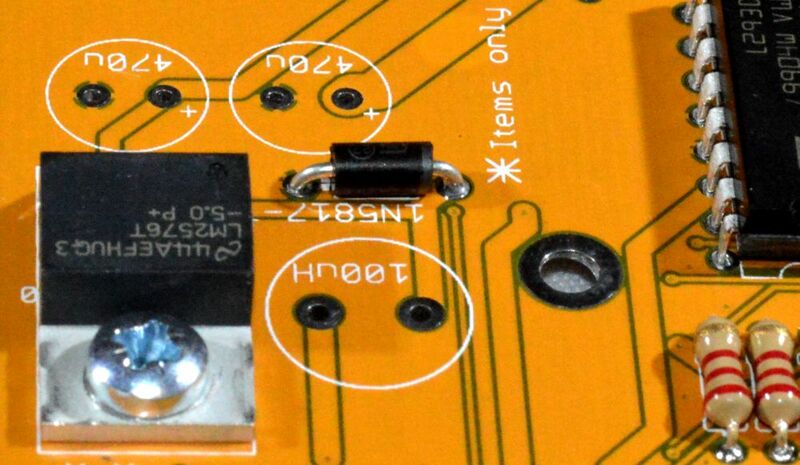 It doesn’t matter which way round it is fitted. 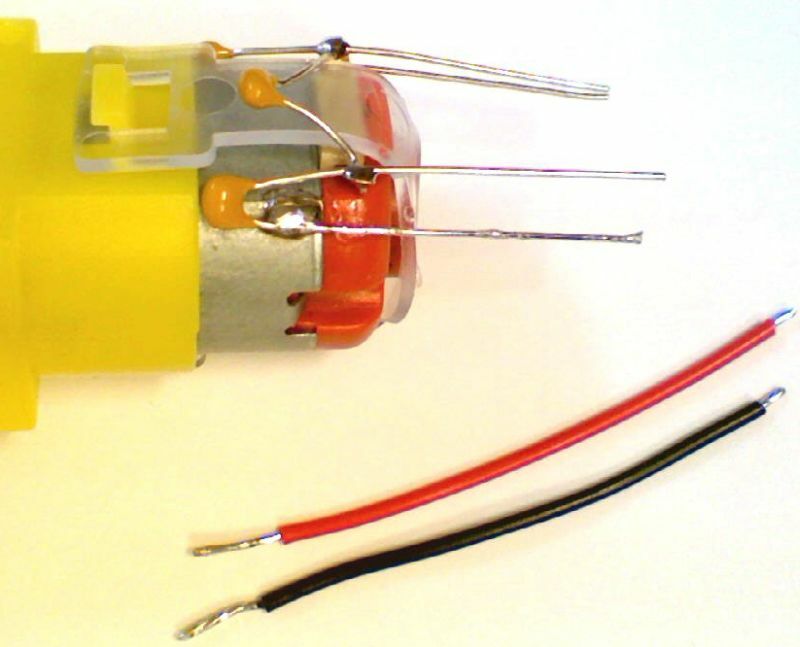 If required, the other 2 capacitors should be soldered between one motor terminal and the metal case, as shown above. You will need a hot iron to heat up the case sufficiently to melt the solder. 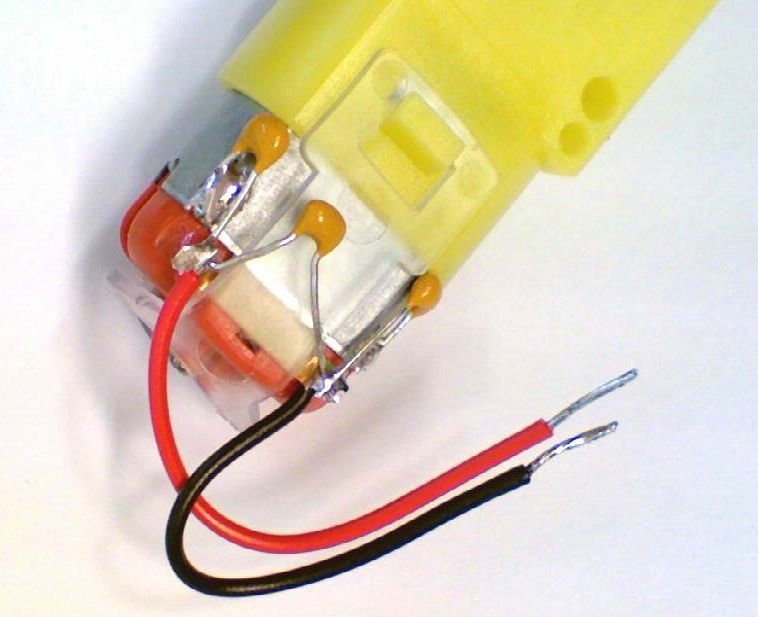 Also, the motor case can become oxidised over time making it very difficult to solder to. Some “wet and dry” sand paper can be used to brighten up the metal if required. 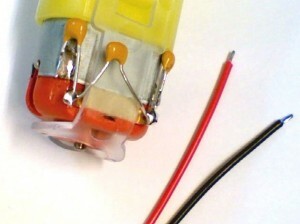 Solder the Red wire to the top terminal and the Black wire to the bottom terminal, as shown above. If you solder them the other way round the Pi2Go-Lite will run backwards. 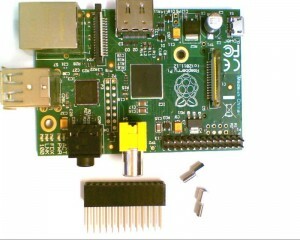 For each Raspberry Pi mounting position you will need a 20mm M2.5 pillar, an 8mm countersunk screw and a 3mm spacer. Here we have mounted 2 pillars in the correct positions for a Model B. Screw the countersunk screw through the PCB from the bottom, through the spacer and into the 20mm metal pillar. 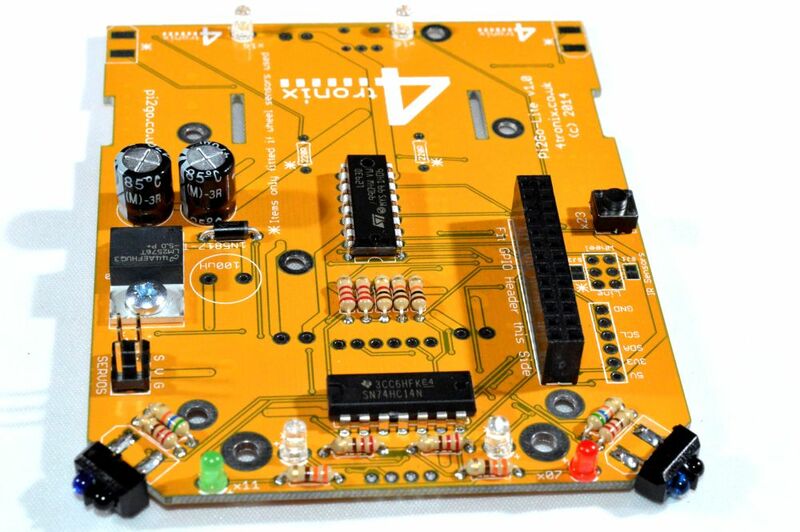 Push the motor mount PCBs from the top of the main board so that the holes line up with the mounting holes in the motor. 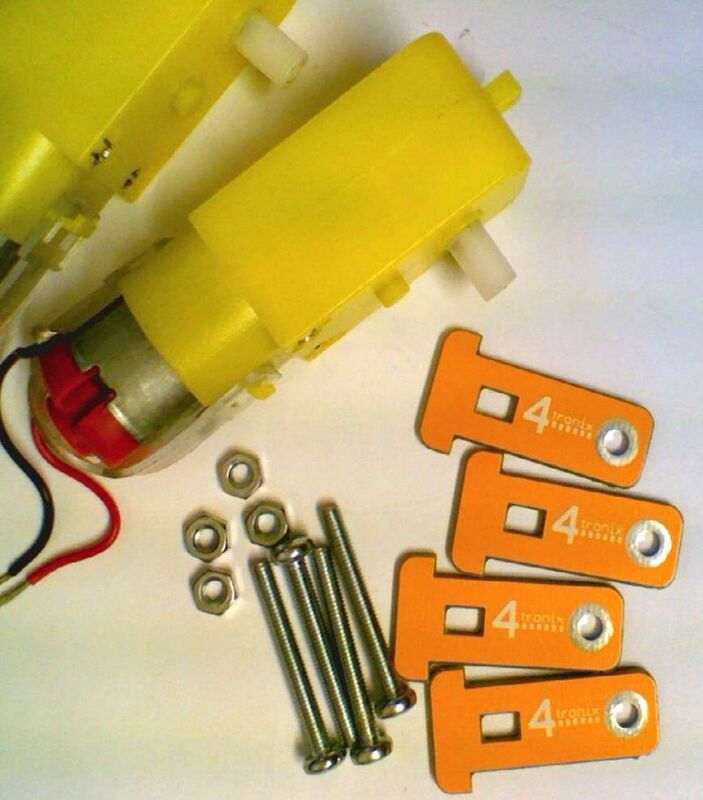 Pass the 25mm screws from the outside, through one mount, through the motor and then through the second mount. 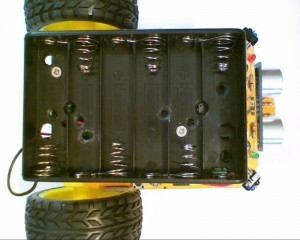 Screw into the M3 nuts on the inside. Repeat for both motors. To mount a Model B you will need an extended GPIO header and 2 x 5mm male-female pillars. 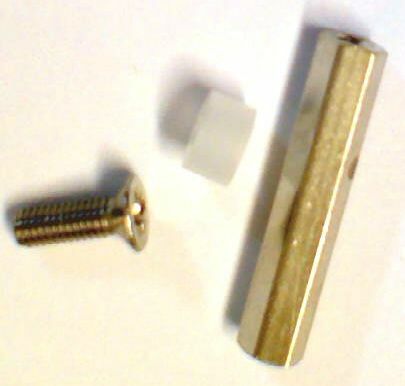 To mount a Model B+ you will need also need 2 x 4mm countersunk screws. For the B+ use the screws for two front mounts and the 5mm male-female pillars for the two rear mounts. 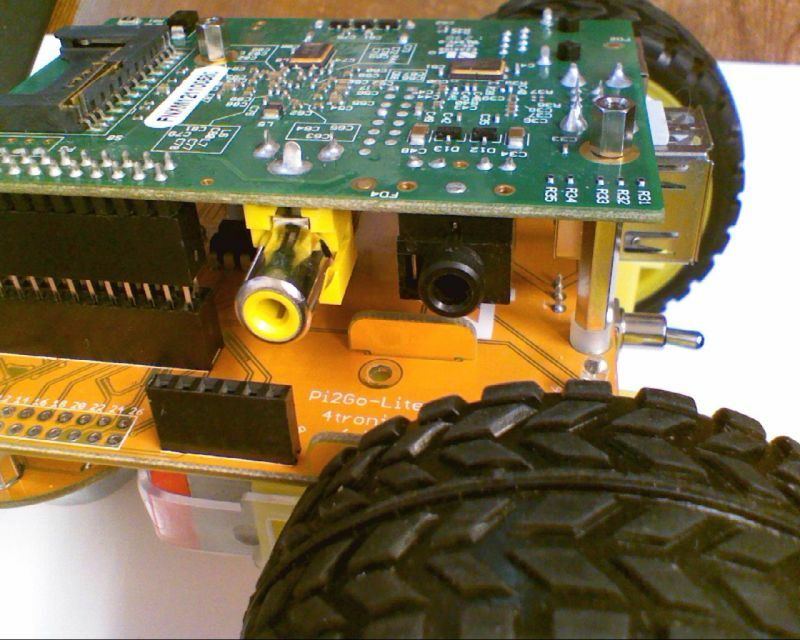 Push the extended header into the GPIO header on the main PCB, then carefully push the Raspberry Pi onto the extended header. 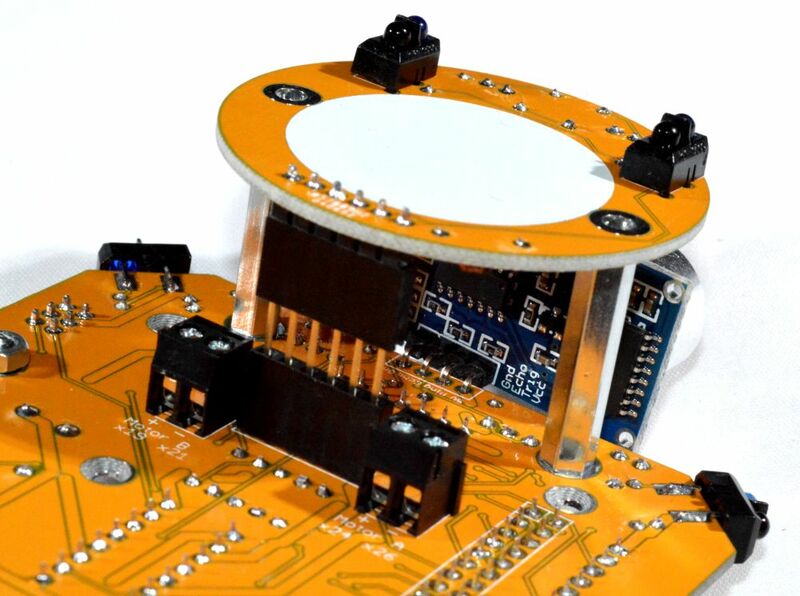 Ensure that the mounting holes in the Pi match the pillars. 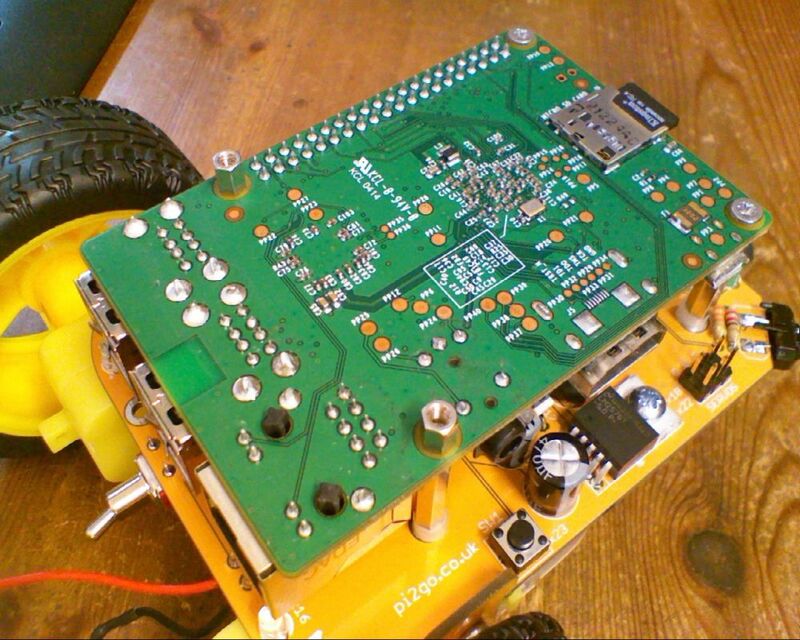 If not, check that the GPIO header is plugged into the correct position. 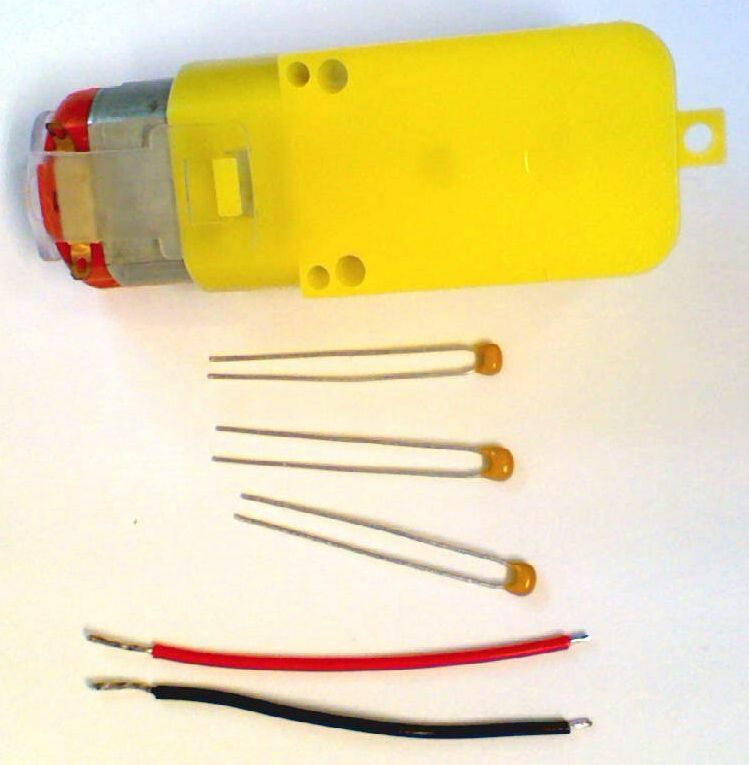 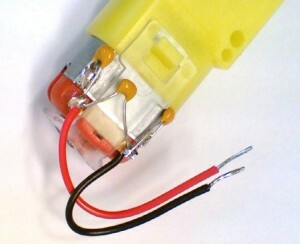 Fit the red wire from battery holder into the position nearest the switch – marked VBAT. The black wire goes into the position next to the motor. 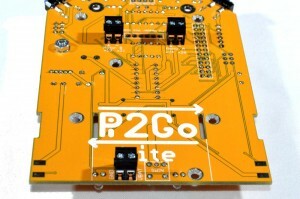 Your Pi2Go-Lite is now Complete!